“Oeconomicae et pecuniariae quaestiones” outlines sound general principles, but also reflects the Church’s present struggle to comprehend modern finance. In the third section, however, the document offers what it calls “Some Clarifications in Today’s Context.” But clarity isn’t the strong point of this section. It muddles some helpful observations with questionable claims about the present state of financial markets, incomplete analyses of particular questions, and truncated discussions of some of the financial sector’s biggest problems. The first substantive point to note about Oeconomicae pecuniariae et quaestiones is that it’s free of populist hyperbole like “this economy kills!” There’s no demonization of capital. Indeed, the document states that money “is a good instrument . . . a means to order one’s freedom and to expand one’s possibilities” (15). The financial sector likewise is presented as “something positive” insofar as it engages in circulating capital (15). More could have been said about the ways in which financial markets realize this goal by managing risk, engaging in the formation of prices, putting capital to work in efficient ways, correcting misallocations of resources within and between economies, and, above all, establishing links between the economic present and economic futures of individuals and communities. Absent these capacities, all of us would be living materially poorer—and considerably shorter—lives. This positive approach provides a basis for Oeconomicae pecuniariae et quaestiones to articulate a number of reference-points useful for anyone in finance who wants to live a morally good life. These go beyond stating that money is an instrument and not an end in itself (15). They includes recognizing that good relationships, including financial relationships, are built upon people’s good use of their freedom (8) and that while economic logic has its place, it can’t capture the full meaning of human choice and action. Put another way, without the right understanding of the human person (9), you can’t establish a sound ethics. Without sound ethics, the economy won’t be an arena for human flourishing. If you get human anthropology wrong, everything else will go wrong—including finance. For many Catholics and others, this is all a given. But in a world in which many people have never had this connection explained to them, it’s a point which bears repeating. The document’s positive emphasis also leads it to affirm that finance has a “primary vocation” inasmuch as “it is called to create value with morally licit means, and to favor a dispersion of capital for the purpose of producing a principled circulation of wealth” (16). That’s not the sort of language we’re used to hearing from religious leaders in economic discussions. The use of the word “vocation” is especially important. It indicates that working in finance can be a calling instead of being dismissed as a necessary but disreputable occupation. Equally noteworthy is Oeconomicae pecuniariae et quaestiones’ statement that “all the endowments and means that the markets employ in order to strengthen their distributive capacity are morally permissible, provided they do not turn against the dignity of the person and are not indifferent to the common good” (13). That’s a warning against being instinctively suspicious of financial markets. Provided that a financial instrument doesn’t in itself involve some fundamental violation of the moral law (e.g., don’t steal, don’t lie etc. ), it should be judged on its capacity to help financial markets grow wealth and spread capital. These and other points contained in Oeconomicae pecuniariae et quaestiones’ first, second, and fourth sections are helpful in identifying core principles which should be central to any sound reflection upon morality and finance. The third section, however, is a different story. Here we find a mishmash of, among other things, commonsense observations (“the market needs anthropological and ethical prerequisites that it is neither capable of giving for itself, nor producing on its own”), extensive use of outmoded business school jargon (“virtuous circularity”), smatterings of different theories of the firm, and some very debatable historical claims. The overall impression is one of an author or authors wandering between offering all-encompassing macro-explanations for the way things are, while regularly descending into some of the micro-weeds of very specific questions. At this point, a ruthless wielding of Occam’s razor would greatly enhanced the text’s readability and, more importantly, its coherence. It’s not that the third section completely lacks merit. I’m very glad that it discusses, for instance, the problems associated with large public debt (32), though what those have to do with offshore tax-havens escapes me. That’s just one example of how the third section proceeds in fits and starts through a bewildering range of subjects in which the connections are not always clear. As a result, some very serious problems facing the financial sector aren’t given anywhere near as much attention as they need. Moral hazard played a major role in the 2008 financial crisis insofar as some large financial institutions overleveraged themselves on the premise that, if a big investment went south, governments would have no choice but to bail them out. Instead, however, of underscoring the wrongness of expecting other people to pay for your mistakes or pointing out that allowing banks to fail would radically diminish this problem, Oeconomicae pecuniariae et quaestiones lurches into a discussion of the morality of everyday shopping-choices. But what’s especially missing in the document’s third section is any consideration of the way that excessive regulation distorts the workings of the financial sector. In multiple places, Oeconomicae et pecuniariae quaestiones insists that the financial sector requires more regulations and regulators. The difficulty is that the financial sector, especially in developed economies, is already heavily regulated. Even before 2008, America’s financial sector was subject to manifold levels of regulation. Thousands more pages of regulations were added to the statute-books following the 2008 financial crisis. Exhibit A is the 2,223 page Dodd-Frank Act signed into law in 2010. Under-regulation just isn’t the primary problem facing today’s financial markets. In the United States, for example, there are no less than eleven federal agencies with financial regulatory responsibilities, ranging from the Federal Reserve to the Commodity Futures Trading Commission. All these agencies administer and interpret thousands of regulations. Their jurisdictions also overlap in ways that truly merit the word “Byzantine.” That doesn’t even count the hundreds of regulatory bodies which function at the level of the states. If anything, the situation in Western Europe is even worse. So what are some of the negative effects of all this regulation? First, excessive regulation can encourage people to think that as long as they comply with the endless legal requirements, they are fulfilling their moral obligations. That facilitates a legalistic approach to morality, something that’s already pervasive in what sadly passes for “business ethics” in many business schools. Second, excessive regulation diminishes access to capital by less well-off segments of society. The costs associated with meeting the demands of regulatory compliance can be absorbed with greater ease by, say, Goldman Sachs than your average credit union. Excessive regulation consequently makes it harder for smaller banks to compete. That puts capital out of reach for many people. Excessive financial regulation also works against start-up businesses. Unlike large companies, first-time entrepreneurs usually don’t have the resources to hire armies of accountants and lawyers to help them navigate convoluted regulatory environments as they seek to acquire capital. If a start-up can’t obtain capital, the enterprise probably won’t begin in the first place. The wealth and employment which could have been created thus never sees the light of day. Third, over-regulation can actually contribute to further separating the financial sector from the real economy. The bigger and more extensive the regulatory environment, the greater the incentives for banks to hire very smart people to work out how to game the regulations to their advantage. Banks subsequently get distracted from their primary purpose of creating and efficiently directing capital to the economy’s productive sectors. Regulators typically react by closing loopholes. But the same very smart people will then work out how to game the new arrangements. None of this is an argument against regulation per se. Nor does it excuse banks from losing sight of their primary function. But Oeconomicae et pecuniariae quaestiones seems blissfully unware of excessive regulation’s many counterproductive effects upon the financial sector. What, however, most struck me about this document is what it could have been, but isn’t. 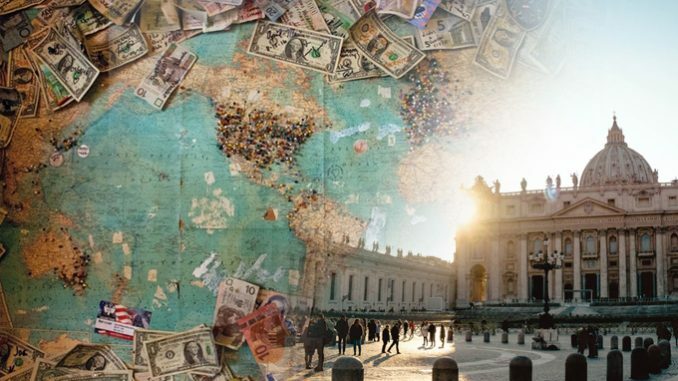 You wouldn’t know it from reading Oeconomicae pecuniariae et quaestiones, but the Catholic Church possesses a vast repository of knowledge on the topics of money, finance, and banking. Medieval and early modern Catholic theologians wrote at length and sympathetically, for instance, about the capital-intensive economies that first emerged in medieval Catholic Europe. Their thought played a major role in sparking the Financial Revolution which helped launch Europe on the path to an economic prosperity that rapidly dwarfed other civilizations’ poverty-alleviating capacities. It’s a matter of record that most of the tools and methods associated with modern finance attained their mature form in this overwhelmingly Catholic world. 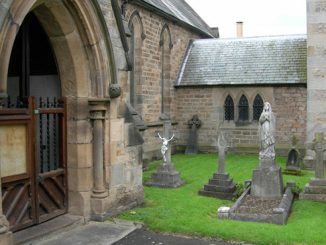 In her 2002 book Medieval Economic Thought, the historian Diana Wood concluded that the intellectual explorations of the nature and use of money by medieval theologians “sanctioned many of the monetary considerations that underlie modern economies.” Before he found himself embroiled in theological debates with Martin Luther as Catholicism’s leading apologist during the early Reformation, Father Johannes Eck spent most of his time penning lengthy treatises on money-lending and identified several instances in which it didn’t amount to usury. Turning to more contemporary sources, mid-twentieth century Jesuits such as Bernard W. Dempsey and Thomas F. Divine extensively studied subjects ranging from the functions of interest-rates to the nature of capital, public finance, currency-exchanges, and the benefits and risks of debt. Moreover, they did so from perspectives informed by Scripture, church doctrine, and natural law reasoning but also a deep grasp of modern economic insights into—and modern economic debates about—these topics. Areas like monetary policy were no great mystery to them. There is, in short, a veritable treasure of intellectual resources upon which Oeconomicae et pecuniariae quaestiones could have drawn to produce a tightly-integrated analysis of the great good produced through finance as well as its real and potential challenges and weaknesses. You won’t find these resources referenced in business schools or in the world’s financial houses. But they contain many uplifting and challenging truths about morality, economics and finance that the world’s bourses need to hear. Vatican City, Aug 5, 2017 / 09:06 am (CNA/EWTN News).- On Saturday, Pope Francis sent a message mourning the death earlier that day of 83-year-old Italian Cardinal Dionigi Tettamanzi, Archbishop Emeritus of Milan. “In learning of the news of the passing of the dear Cardinal Dionigi Tettamanzi, I wish to express my condolences to his family and members of that diocesan community, which lists him among her most illustrious sons and most lovable and beloved pastors,” the Pope said in an Aug. 5 telegram. Archbishop of Milan from 2002-2011, Tettamanzi was a moral theologian and a leading voice in the Italian Church, and at one point was even considered a likely candidate for the papacy. Born March 14, 1934 in Renate, Italy, Tettamanzi was just 11 years old when he entered the seminary of Seveso San Pietro, where he began his initial studies. He then attended the Seminary of the Lower Venegono until 1957, when he received a licentiate in theology. That same year he was ordained a priest for the Archdiocese of Milan, and later obtained his doctorate in moral theology from the Pontifical Gregorian University in Rome. For over 20 years, the cardinal taught fundamental moral theology at the Lower Venegono seminary and pastoral theology at the Priestly Institute of Mary Immaculate and the Lombard Regional Institute of Pastoral Ministry in Milan. Throughout his career, the prelate authored several written works, contributing to the Vatican newspaper L’Osservatore Romano and the Italian bishops’ daily paper, Avvenire. From 1979-1989 he was active in the Italian Confederation of Family Counseling Centers of Christian inspiration as well as in “Oari,” a pastoral movement dedicated offering hope to those who suffer. He was also involved in the Milan branch of the Association of Italian Catholic Medical Doctors for nearly 20 years. Tettamanzi was given the title “Monsignor” in 1985, and just two years later, in September 1987, he was tapped to serve the Pontifical Lombard Seminary. While in that role, he continued to serve the Italian Bishops Conference (CEI) in various roles, and collaborated with the Holy See and various theological institutes. On July 1, 1989, he was named Archbishop of Ancona-Osma, and received his episcopal ordination Sept. 23, 1989. While there, he also served as head of the CEI’s Marche region. Then in June of 1990, he was elected president of the CEI Bishops Commission for the Family. He was named Secretary General of the CEI in March 1991, and in April resigned from his position leading the diocese of Ancona-Osimo. Four years later, on April 20, 1995, he was named Archbishop of Genoa, and served as president of the regional bishops’ conference. Just a month later, in May 1995, he was named Vice President of the CEI, a position he held until 2000. In addition to the various responsibilities he carried out, Tettamanzi participated as an expert in the 1980 Synod of Bishops on the Family and the 1987 Synod on the Laity convoked by John Paul II. He was also a synod father at the two Special Assemblies of the Synod of Bishops for Europe in 1991 and 1999, as well as the 1994 Synod on Consecrated Life. Tettamanzi was named Archbishop of Milan in July 2002, taking over for Jesuit Cardinal Carlo Maria Martini, whose legacy, for many, was carried forward by Tettamanzi. He was named a cardinal by John Paul II in the consistory of February 1998, and was tapped by Pope Francis to participate in the XIV Ordinary General Assembly on The Vocation and Mission of the Family in the Church and Contemporary World in October 2015. Having been under the age limit of 80 during the 2013 conclave that elected Pope Francis, Cardinal Tettamanzi voted in both that and the conclave that elected Pope Benedict XVI in 2005. In his telegram for the cardinal’s passing, Francis prayed that God would “welcome this faithful servant, whom he loved so greatly, in joy and eternal peace,” and offered his blessing to all those mourning, and to those who “lovingly assisted” the cardinal during his last few years of illness. 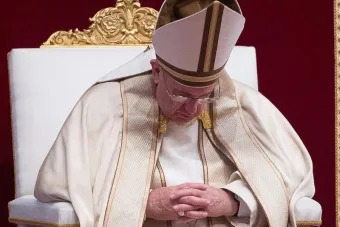 Vatican City, May 30, 2017 / 04:53 pm (CNA/EWTN News).- Pope Francis on Tuesday urged priests and bishops not to be afraid to “step down completely” from their assignment when they are called to a new duty. “All shepherds have to step down. 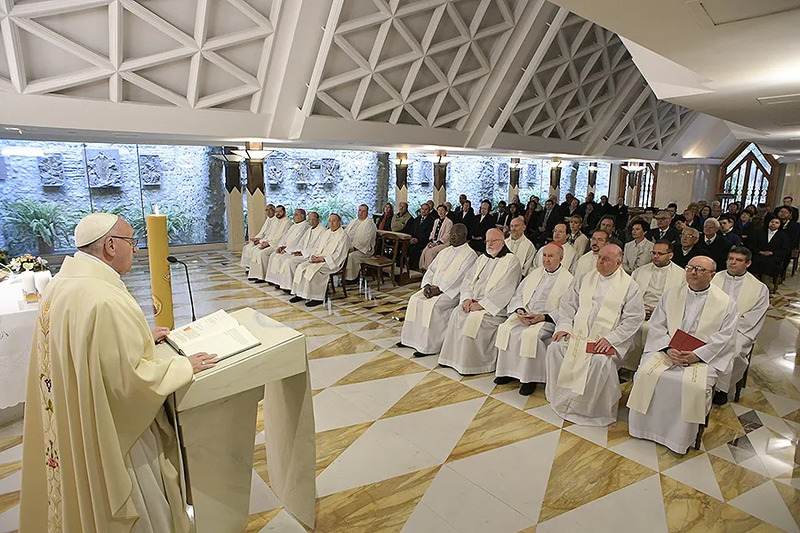 There comes a moment where the Lord says ‘go to another place, come here, go there, come to me.’ And it’s one of the steps that a shepherd must take,” he said during his homily May 30 at the chapel of the Vatican’s Santa Marta residence. The shepherd must “be prepared to step down in the correct way, not still hanging on to his position,” he said. In the first reading of the Mass, St. Paul addresses the Church leaders in Ephesus. The Pope said Paul left the Ephesus to go to Jerusalem, following the Holy Spirit’s call. The Pope highlighted what he called the three “apostolic attitudes” demonstrated by St. Paul during a council with the priests of Ephesus, and he urged the faithful to pray that priests, bishops, and the Pope would live their lives accordingly. The first attitude involves never turning back, and guiding the Church without compromise. The second is obedience to the Spirit and the recognition that the life of a shepherd is a “journey,” always open to the voice of God. Does the document mention fiat money? And condemn it as thievery? With neoliberal economics siphoning off ever more of the world’s wealth into ever fewer hands – of people, moreover, who are incapable of restraint, however suicidal, indeed, deadly to the whole planet it is, everything else, it seems to me, is tinkering around the edges.